NEWARK, Del. -- Delaware State Police have arrested a Newark woman and charged her with felony assault following an alleged road rage incident. Police said the incident began at approximately 9 a.m. on Tuesday, October 31, as the victim, a 62 year old Middletown woman, was stopped on Pulaski Highway in the area of Perch Creek Drive, Newark, waiting to make a turn into the Kohls Department Store parking lot. 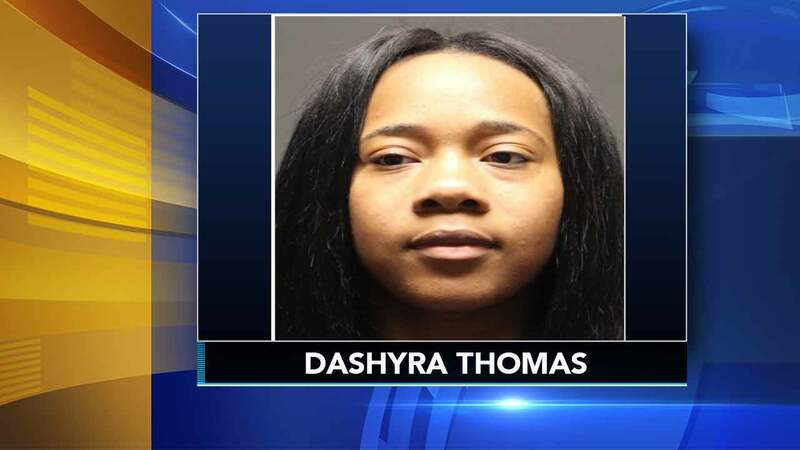 The driver of a Dodge Charger, later identified as Dashyra Thomas, 23, was following directly behind the victim, became impatient and began blowing her horn. The victim eventually turned into the Kohls parking lot and Thomas followed. According to police, once both vehicles were stopped in the lot Thomas began yelling at the victim. Both subjects exited their vehicles and then became engaged in a verbal altercation. Police said Thomas then struck the victim multiple times in the face with her closed fist, causing injury to her left eye and nose. Police said witnesses intervened and separated the two, but then Thomas got in her car and drove off. Troopers were able to locate Thomas and the Dodge Charger at her home. When troopers advised Thomas that she was under arrest, she allegedly tried to run back into her house, despite multiple verbal commands to stop. Police said after a brief struggle Thomas was handcuffed and taken to Troop 2 where she was charged with one count each of second degree assault, resisting arrest and disorderly conduct. Authorities said Thomas' 4-year-old son was in her car during the incident, so she was also charged with one count of endangering the welfare of a child. Thomas was arraigned in Justice of the Peace Court 2 and released on $4000 unsecured bond.